Veneers are very thin pieces of porcelain. They are custom-made by a professional dental ceramist, crafted for proper shape, form and color. They are bonded onto the front of teeth to create a beautiful and attractive smile. Veneers can completely reshape your teeth and your smile, giving you a beautiful long-lasting smile. They can often be alternatives to crowns and are the ideal solution in treating many dental conditions. Although very durable with the potential to last many years, as with most dental restorations, veneers are not permanent and may someday need replacement. Cosmetically, they create a uniform, white, beautiful smile. What does getting porcelain-veneers involve? Getting veneers usually requires two visits to complete the process, with littl or no anesthesia required during the procedure. The teeth are prepared by lightly preparing and shaping the surface to allow for the thickness of the veneer. A mold or impression of the teeth is taken and a shade (color) will then be chosen by you and Dr. Simone. On the second visit, the teeth will be cleansed with special liquids to achieve a durable bond. 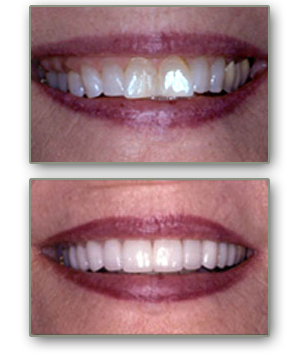 Bonding cement is then placed between the tooth and veneer and a special light beam is used to harden and set the bond. You will receive care instructions for veneers. Proper brushing, flossing and regular dental visits will aid in maximizing the life of your new veneers.